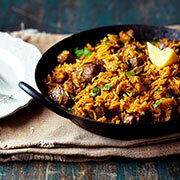 When thinking of Indian food, many people think of curries and rice. But there's much more to Indian food than this. There are dozens of regional Indian cuisines, each with its own special dishes. 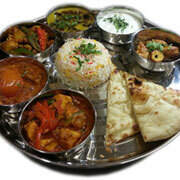 To make it easier to understand Indian cuisine, it's often divided into two main types; North Indian and South Indian. In many cases they use different cooking methods, different ingredients, and even different spices. 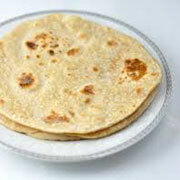 For example, wheat-flour flatbreads are common in the North while in the South rice is more common. This is because North Indian food was greatly influenced by Middle Eastern cuisines of the Islamic Mughal Empire in which flatbreads were the staple foods, while South Indian food is more like traditional Hindu cuisine of ancient India in which rice was the staple food. Three of the world's major religions - Hinduism, Buddhism and Jainism - developed in ancient India, and Islam was introduced when North India was conquered by the Mughal Empire in 1526. Each of these religions has its own set of rules about food, and because Indian meals usually include many dishes that are shared, ordering is complicated if people of different religions are eating together. In Hinduism the cow is a sacred animal, so most Hindus don't eat beef. Eating pigs is strictly forbidden in Islam, and most Muslims also refuse to eat other animals unless they're killed in a certain way. Jains never eat meat of any sort, and many don't eat onions, potatoes or garlic either, while many Buddhists also prefer a vegetarian diet. In fact, it might be best to let others order an Indian meal unless you know everyone's religion, or unless you're only ordering vegetarian dishes that everyone can eat like potato and cauliflower aloo gobi or a simple dish like dal that only contains lentils and spices. Using the fingers to eat is common in India, and foreigners are welcome to eat this way too. But if you eat with your fingers, you must never touch the food with your left hand. Hold it between the fingertips of your right hand or scoop it up with a piece of flatbread. Try to eat without putting your fingers in your mouth or licking them. Wash them instead in one of the small bowls of water on the table. Even though Indian meals aren't normally served in separate courses like European meals, many Indian restaurants now list their dishes in this way. They offer traditional Indian snack foods as appetizers. 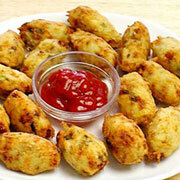 These can include deep-fried pakoras of various kinds such as vegetable pakoras and cheese-filled paneer pakoras. Paneer is an Indian cheese similar to cottage cheese, and if you see this word in a dish's name it means it contains this cheese. 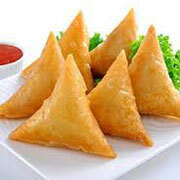 Other popular snack foods now served as appetizers include deep-fried bhajis and samosas of various kinds, some with a meat filling and others with a vegetable filling. Many Indian restaurants also serve kebabs as an appetizer these days. Most restaurants in India serve main course dishes from one region only, but Indian restaurants in other countries usually serve dishes from both North and South India. North Indian dishes include many that came from Mughal cuisine like korma in which meat or vegetables are braised with yoghurt or cream, and many that are cooked in a large clay-pot oven called a tandoor. These include roasted tandoori chicken and a dish called chicken tikka in which marinated pieces of boneless chicken are grilled on a skewer inside a tandoor oven. 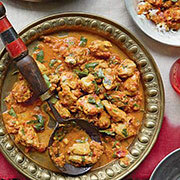 Pieces of chicken tikka are also used in a spicy North Indian curry called chicken tikka masala that's often flavoured with a mix of spices called garam masala. Tandoor ovens are also used for baking thin, round flatbreads like tandoori roti as well as thicker, longer flatbreads like nan and its popular variants garlic nan and the spicy lamb-filled keema nan. Not all Indian flatbreads are baked, however. Many are fried in shallow pans, including plain roti or chapati, a staple food that's often topped with Indian butter or ghee. 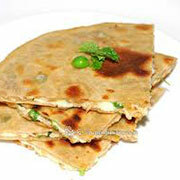 Another is paratha which can be plain or stuffed with vegetables or paneer. Flatbreads like these are made with wheat flour, a staple in the North, while the South's very thin and crisp papadums are usually made from lentil flour instead. 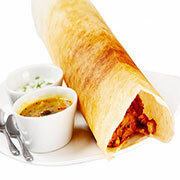 The pancake-like dosa is also from South India, as are main course dishes like madras curry and many other curries made with a wide range of ingredients. Curries in the South are eaten with rice rather than bread, and rice is also found in biryani dishes between layers of chicken, mutton, beef, fish or mixed vegetables. 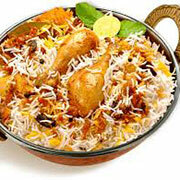 Rice is also cooked along with meat or vegetables in a spicy broth to make many kinds of pilau. Biryani and pilau dishes are good choices if you don't like food that's too hot and spicy, but if you love spicy food, try a hot vindaloo curry and you should be satisfied. 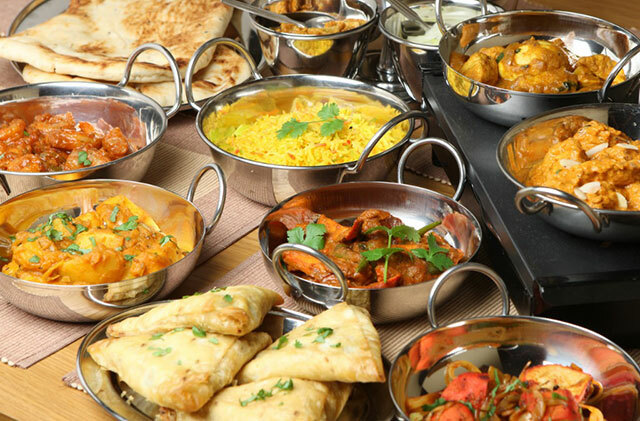 While sharing dishes is normal when a group of people eat Indian food, it's also possible to order a meal for one person. You can do this by ordering a food platter called a thali. Both meat-based and vegetarian thalis are available, and they usually include a main dish like korma or curry as well as some dal, a hot chutney and some cooling yoghurt plus rice and rotis or papadums. And you'll also get some dessert, of course. There are hundreds of delicious Indian desserts, and most restaurants serve quite a few. Some of the most popular are a soft pudding made with coconut or banana or carrot called halva, a creamy rice and milk pudding called payasam, and a very sweet dessert called gulab jamun in which soft dough-like balls are soaked in a sugary syrup. But the most popular dessert of all is probably a very rich traditional Indian ice-cream called kulfi. It comes in many flavours, and if you get the chance try one of the more traditional ones like rose, saffron, cardamom, mango or pistachio. 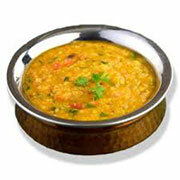 Indian meals are best enjoyed with traditional Indian drinks. In hot weather cool drinks like coconut water, a palm nectar drink called neera and the spicy jal-jeera are popular. In cold weather a cup of hot tea or chai that's made with milk, sugar and spices is a good choice. A great drink for all seasons is a yoghurt shake called lassi. 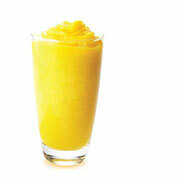 You can order sweet lassi, salty lassi or a fruit lassi like the very popular mango lassi. 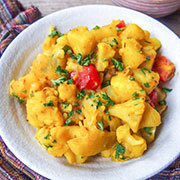 aloo gobi (also alu gobi) (noun): a dish of potato and cauliflower flavoured with garam masala and tumeric - Can we have some aloo gobi as well, please? bhaji (also bhajji) (noun): a deep-fried Indian appetizer with a spicy vegetable filling covered in batter - The bhajis they sell on the street around here are really good. biryani (also biriyani or biriani) (noun): a dish with layers of meat, fish or vegetables mixed with spices cooked between layers of rice - Most Indian restaurants have biryani dishes on the menu. chai (noun): tea made by boiling tea leaves along with milk, sugar and a blend of spices - They sell cups of chai on railway platforms all over India. chapati (or roti) (noun): thin pancake made of whole wheat flour that's cooked on a hotplate - Would you like chapatis with that? chicken tikka (noun): small pieces of boneless chicken cooked on a skewer in a tandoor oven - I love the chicken tikka they make here. curry (noun): a meat or vegetable dish cooked in a spicy Indian-style sauce, often eaten with rice - Jason makes a pretty good vegetable curry. dal (also dhal) (noun): lentils cooked with various spices and flavourings - If you order a thali, it'll come with some dal. dosa (noun): a thin Indian pancake made with rice flour and black beans - My grandma makes the best masala dosa in the world! 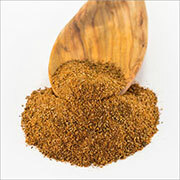 garam masala (or masala) (noun): a mixture of powdered spices used in Indian cooking - Add a teaspoon of garam masala and stir. 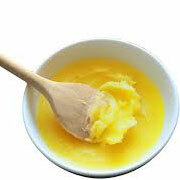 ghee (noun): a type of butter used in Indian cooking - Grandma still uses ghee when she cooks. 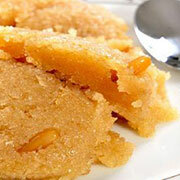 halva (also halwa) (noun): a sweet pudding made with semolina and added ingredients like carrot, coconut, cashew nuts, etc. - I love that carrot halva that Kumar makes. kebab (noun): meat and vegetable pieces grilled or roasted on a skewer - Have you tried the shami kebab they make here? 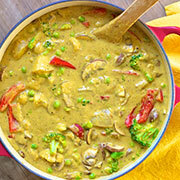 korma (noun): meat, fish, or vegetables braised with cream or yoghurt - Would you like to try our vegetable korma? kulfi (noun): traditional Indian ice-cream - I really love mango kulfi! lassi (noun): an Indian drink made of yogurt, water and spices, with fruit sometimes added - I'll have a sweet lassi, please. 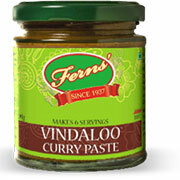 madras curry (noun): a hot curry, either meat-based or vegetarian, from South India - I had the madras curry on rice. 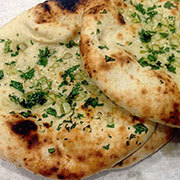 nan (also naan) (noun): a soft, thick, leavened flatbread that's baked in a tandoor oven - Let's get one garlic nan and two plain nans. 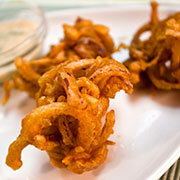 pakora (noun): a deep-fried North Indian snack or appetizer - Didn't your mum teach you how to make pakoras? paneer (noun): Indian cooking cheese similar to cottage cheese - It's got "paneer" in its name, so it must have cheese in it. 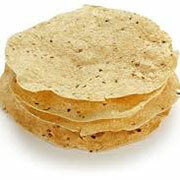 papadum (also pappadam) (noun): a thin, crisp, disc-shaped flatbread made with lentil flour - Let's have some papadums as well. paratha (noun): a thick, fried flatbread with extra ingredients like potato or cauliflower often added - I'll have a potato paratha to go, please. pilau (also pilaf or pulao) (noun): rice cooked in a broth with meat, vegetables or lentils often added - Let's try the lamb pilau this time. samosa (noun): an appetizer in which a filling of cooked meat or vegetables is wrapped in pastry and deep-fried - Do you have real Indian-style samosas? 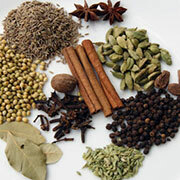 spice (noun): a dried plant part that's added to food to give it flavour - Do you have any spices imported from India? tandoor (also tandoor oven) (noun): an oven traditionally made of clay in which flatbreads, samosas, roast meats and vegetables, etc. 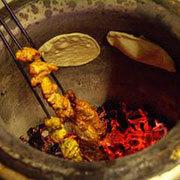 are cooked - They serve hot nans straight out of the tandoor. 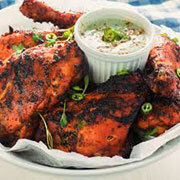 tandoori chicken (noun): marinated chicken pieces roasted in a tandoor oven - Don't you love the smell of tandoori chicken? tandoori roti (noun): roti flatbread that's baked in a tandoor rather than fried - Don't forget to order the tandoori roti, will you? thali (noun): a meal for one person served on a platter (also called a "thali") with several different dishes - I'll have a vegetarian thali, please. 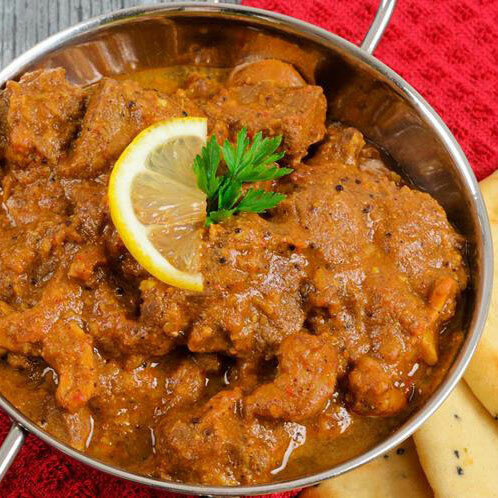 vindaloo (noun): a very hot and spicy type of Indian curry - Are you sure you can eat a really hot curry like beef vindaloo?